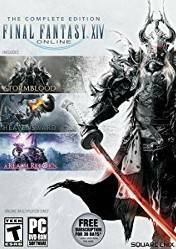 Final Fantasy XIV Complete Edition is the definitive package for all those wishing to start in this SquareEnix MMORPG set in the famous and mythical world of Final Fantasy. This edition includes: The base game Final Fantasy XIV A Realm Reborn, the expansion Heavensward and the second expansion Stormblood, so with this package we can enjoy all the content released so far. With Heavensward we will expand the main story and allow us to live more adventures, with more dungeons, raids, main and secondary missions, new equipment, and even have access to two new classes. With Stormblood we will take our adventure much further, with the implementation of 10 levels for our class, new bosses, new weapons and equipment and two new classes, the Samurai and Red Mage. It is the second most played payment MMORPG, with millions of players around the world and with a system of classes that will allow us to change at any time of Role simply by changing weapons, so we can upload and specialize in any of the classes available. There are no comments yet about Final Fantasy XIV Complete Edition. You can be the first one!